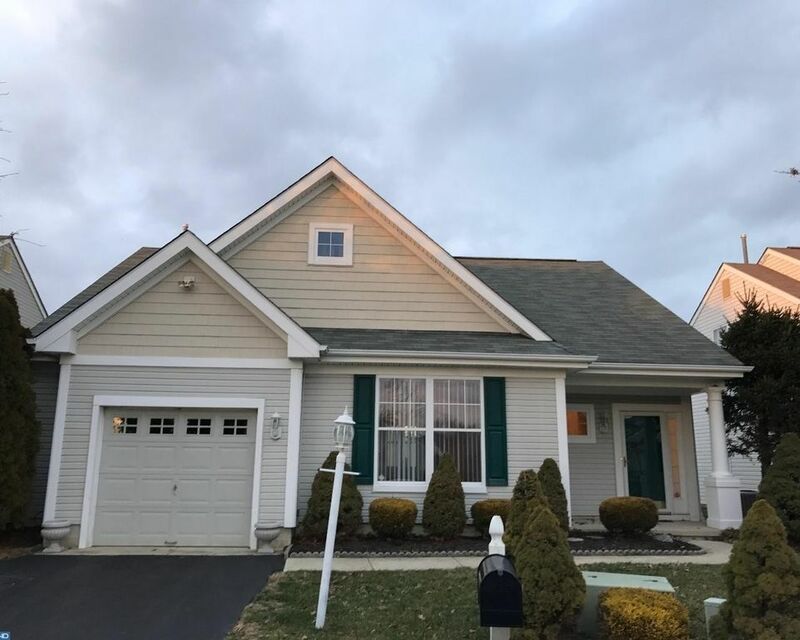 Beautifully maintained 2 BR 2 Full Bath Ranch style home located in desirable Village Greenes, Marlton N.J. The home features 1532 sq.ft. of living space and is in immaculate condition with 9 ft ceilings throughout. Step in from the front porch to a foyer entrance that leads to a large open & airy living room with crown molding & picture window. The formal size dining room has crown molding. A spacious freshly painted eat in kitchen has a brand new gorgeous granite counter top with a stainless under mount sink, upgraded raised panel white cabinets, glass top electric self clean range, dishwasher, disposal, upgraded light fixture, pantry closet, recessed lighting and a door leading to the out back patio. The Laundry room includes a washer, dryer, utility tub, shelving, a closet and a door leading to the one car garage that has a storage nook with enough space to place shelving and has a separate heater closet & attic storage space. Enormous master bedroom suite with an oversized walk in closet, tray ceiling, ceiling fan, and a master bath with ceramic tile floor, stall shower, and linen closet. The roomy second bedroom has a closet and is located next to the main bath that has a tub shower, vanity, and a ceramic tile floor. Other upgrades and improvements throughout the home include recessed lighting, lighting fixtures, arched raised panel doors, custom blinds, and a security system. The home is on a professionally landscaped lot and is situated at the back of a cul de sac and has an in ground sprinkler irrigation system. The community has an active association which has a clubhouse with a pool table, library, card rooms, a large social room with a dance floor, pool, and tennis court. Don't miss out on this exceptional opportunity!